Does your family do themed dinner nights such as Meatless Monday or Taco Tuesday? Ready to mix it up a bit? 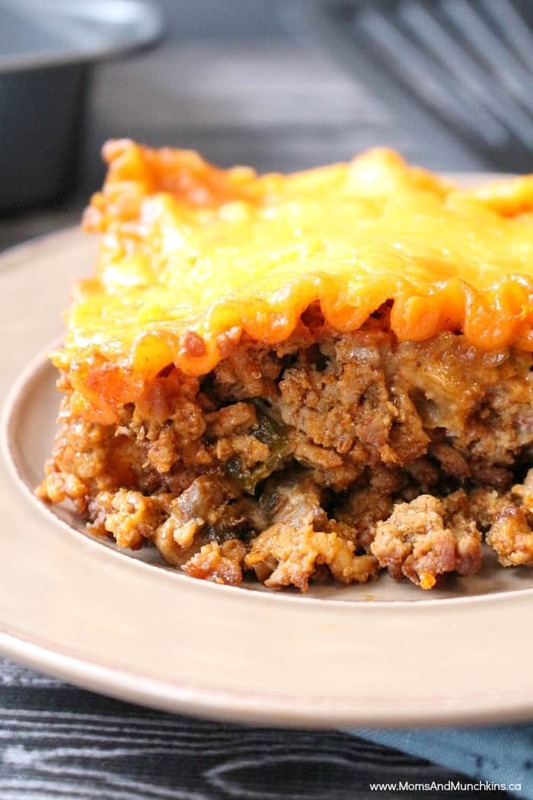 You can switch up your regular Taco Tuesday night with this delicious Taco Lasagna! It’s easy to make and it spices up your regular routine for a night (or two because I’m sure you’ll have leftovers!). This recipe is very filling so a smaller sized lasagna in a 8×8 pan would be more than enough to feed a family of four. In a large frying pan, cook beef thoroughly. Add red pepper and tomato to frying pan. Mix taco seasoning with 1 cup of water and pour over beef mixture. Turn oven to medium-low and simmer for 10 minutes. Remove from heat. Pour one half of the beef mixture in the bottom of an 8x8 baking dish. Top with uncooked, oven-ready lasagna noodles (one flat layer of noodles, don't overlap them). Pour half the queso cheese over the noodles. Sprinkle with half of the shredded cheese. Pour the rest of the beef mixture on top then layer again with noodles, queso and shredded cheese. Place foil over the baking dish and place in the oven for 45 minutes. After 45 minutes, remove foil from baking dish and continue baking for 10 minutes. Serve hot with a scoop of sour cream on each portion. I love this recipe! Great idea for a weeknight dinner.. Thanks for sharing..